When Guiding Eyes for the Blind realized that some of its trained dogs lacked the self-assurance to be guide dogs, it discovered that the animals could be retrained to help children with autism. trained to provide assistance to an individual with a disability. If they meet this definition, dogs are considered service dogs under the ADA regardless of whether they have been licensed or certified by a state or local government. Service dogs perform some of the functions and tasks that the individual with a disability cannot perform for him or herself. Guide dogs are one type of service animal, used by some individuals who are blind. This is the type of service animal with which most people are familiar. But there are service dogs that assist persons with other kinds of disabilities in their day-to-day activities. Some examples include: alerting and protecting a person who is having a seizure; reminding a person with mental illness to take prescribed medications; and calming a person with Post Traumatic Stress Disorder (PTSD) during an anxiety attack. When Guiding Eyes for the Blind, an internationally accredited, nonprofit guide dog school located in Yorktown Heights, N.Y., realized that some of its trained dogs lacked the self-assurance to be guide dogs, it discovered that the animals could be retrained to help children with autism. This led to the establishment in 2008 of Guiding Eyes’ “Heeling Autism” Program. For purposes of the program, a select number of dogs are chosen from Guiding Eyes’ well-established breeding colony of dogs with superlative temperaments and ideal dispositions to become autism service dogs. The selected dogs are then trained in procedures designed keep “their child” safe. These include counter measures a dog is trained to take when a child attempts to run away from his or her parents. from bolting, but also over time cuts down on the frequency of the child’s break away behavior. whomever he was with, and without regard to any potential dangers around him. This behavior resulted in the Mandells being confined to the family house, it being too dangerous to go out with Sam. This, in turn, hampered Sam’s social development by keeping him away from public exposure. 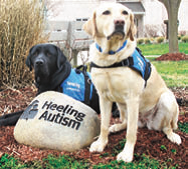 The Mandels were nearly at wit’s end when they learned of Guiding Eyes’ Heeling Autism service dog program. They contacted the organization and soon thereafter received “Hagrid,” a specially trained two year old Labrador Retriever. Sam and Hagrid bonded almost immediately and became inseparable friends, sleeping together every night. And the Mandell family can now go anywhere with Sam and Hagrid, and have been to such highly populated places as Disney World. Sam now walks proudly with Hagrid by his side, and the incidences of Sam trying to run away are greatly reduced. those with chronic disabilities encounter daily. However, I’ve personally found that humor has to a great extent helped me cope with my disability (I’ve had Multiple Sclerosis for 45 years and use a wheelchair), and I hope this column helps others in the disabled community do so as well.